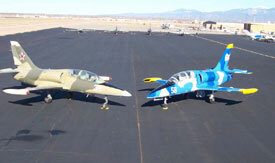 Company founder, Larry Salganek, has been instructing pilots for 25 years. Most of his instructing has been in warbirds, both piston and jets, including the T-34, T-33, T-28, YAK 18, YAK 52, CJ-6 Provost T-5, Mig 15/17, L-29, L-39 and Siai Marchetti and Fouga Jets. Larry has probably spent more hours instructing civilians in military piston and jet aircraft than anyone else in the United States. Larry currently holds low altitude airshow waivers in the T-34, YAK 52, Marchetti 260, L-29, L-39, Mig 15, T-33 and Fouga Jets. He is a CFI, CFII, and MEI and is an FAA Designated Examiner in our jet warbirds. Students at the Jetwarbird Training Center range from 40-hour students to 20,000-hour airline pilots. They come from many different countries to satisfy a variety of interests including aerobatic and spin training in out T-34, BFRs, High Performance Endorsements and type ratings. Our students include military pilots, ex-military pilots, civilian 172 pilots, airline captains, and even an astronaut or two! Each program is based upon your previous experience and your "flight desires." We do everything possible to make our students' experience in Santa Fe a positive one. If you are from out of state or another country, we will do our best to make you comfortable and your stay both productive and enjoyable.